On May 27 1937, the Golden Gate Bridge was completed and nearly 200,000 people walked its length. The massive 27 feet monolithic structure remains etched on the skyline of San Francisco. The San Francisco Golden Gate Bridge is a landmark bridge spanning the San Francisco Bay. This orange colored bridge is a suspension bridge span between the Pacific Ocean and San Francisco Bay. 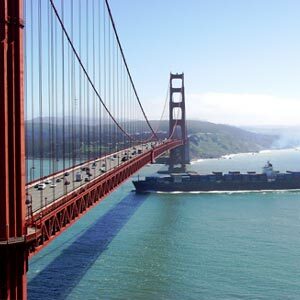 Find out interesting trivia and information about the Golden Gate Bridge and check out some of the popular tours. The San Francisco Golden Gate Bridge is more than a mile and half long and connects the city to Marin County. This suspension bridge was designed by Joseph Strauss and Irving Morrow. Vista points and parking areas are located at the northeast and southeast ends of the bridge. Pedestrians can access east sidewalk from 5am to 9pm. The history of the Golden Gate Bridge dates back to 1928 when its construction was commenced. At a staggering cost of $35 million, the bridge held pride of place as the longest suspension bridge in the world for many years. It was built against the force of harsh natural elements such as foggy weather, gushing winds and strong ocean currents. In 1928, the six counties of Northern California formed a Golden Gate Bridge and Highway District. In 1930, the voters appropriated a $35 million bond issue to finance the building of the bridge. A walk on the Golden Gate Bridge gives you a breathtaking view of the city, the Alcatraz and the Marin headlands. Visitors to the Golden Gate Bridge can take free walking tours or conducted tour cruises around the Bay area. A walking tour of the Golden Gate Bridge will allow you to study the structure and its features. You can enjoy the wonderful view of the Bay area too. Ferry ride tours of the Golden Gate Bridge start from Fisherman's Wharf and pass Fort Mason, Marina district, St. Francis Yacht Club and the Presidio. Ferry tours of Golden Gate also come combined with Sausalito tour. The bridge was closed three times due to inclement weather condition. The two great cables extending from the bridge contain 80,000 miles of steel wire - enough to encircle the equator thrice.